The Johns Hopkins Rising to the Challenge campaign is halfway to its goal of raising $4.5 billion to foster discovery and scholarship, advance health, identify innovative solutions to global problems and bolster support for faculty and students. Gifts and pledges to the campaign from more than 162,000 donors passed the 50 percent mark — $2.25 billion –– in early November, said Ronald J. Daniels, president of The Johns Hopkins University. 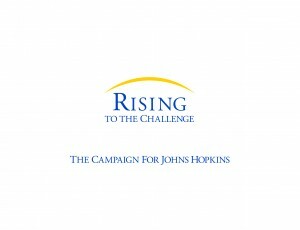 Rising to the Challenge: The Campaign for Johns Hopkins is the largest-ever fund-raising effort undertaken by the university and its sister institution, the Johns Hopkins Hospital and Health System. Campaign planners had originally expected not to reach 50 percent of the goal until spring of 2014. So far, donors have endowed 94 professorships and designated $190 million for undergraduate and graduate student aid. A total of 262 donors have made campaign commitments of $1 million or more, 28 of those at $10 million or more. There have also been more than 365,000 gifts of $1,000 or less. “Each gift, no matter its size, contributes significantly to the work of our faculty, students and health professionals, and to our efforts to use knowledge to make the world a better place,” said Paul Rothman, chief executive officer of Johns Hopkins Medicine and Baker Dean of the School of Medicine. The largest gift ever to Johns Hopkins, $350 million from philanthropist and New York Mayor Michael R. Bloomberg, a 1964 graduate, was announced in January and is part of the campaign. That gift includes $100 million for student aid; the rest will endow 50 Bloomberg Distinguished Professors promoting collaboration on important questions that cross traditional academic disciplines. The Science of Learning Institute, one of the campaign’s “signature” interdisciplinary initiatives, has attracted a $20 million contribution and a number of other gifts for a total of $37.1 million. The institute is bringing together neuroscientists, cognitive scientists, geneticists, computer scientists and education experts to better understand how people learn, to improve teaching and learning, and to help transform education. It is already funding research projects, including an investigation of genetic contributions to learning ability. Three additional signature initiatives have faculty directors on board and are ramping up both operations and fund-raising: Individualized Health, to promote customized health care; the Institute for Water, a clean water-, public health- and disaster response-focused project; and the Global Health Initiative, which will which will attack the world’s most complex and intractable health problems – such as HIV, diabetes and malaria – through a broad multidisciplinary approach. The campaign’s final signature initiative, the Institute for the American City, perhaps the most interdisciplinary of the five, will pull together faculty, staff and students from 10 Johns Hopkins units. It aims to help revitalize urban centers through research and programs that foster economic growth, improve schools, reduce crime, address health issues and cultivate the arts. The campaign began its “quiet phase” in January 2010. By the time it was launched publicly in early May, there were commitments of $1.94 billion, or 43 percent of the goal, from more than 150,000 donors. In the six months since then, another $310 million has been given or pledged. The campaign is targeted for completion in 2017.